Dare you face the quest? Will you take up weapons and begin a zealous crusade to hunt down the monsters of legend? 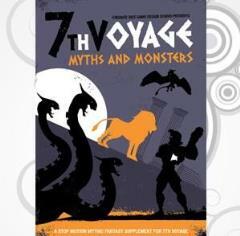 Or will you take on the role of one of these mythic beasts, unleashing their savage rage and power on the world of 7th Voyage? Concentrating on two of the greatest stories of Ancient Greece, that of Heraklesâ€™ Twelve Labours and Odysseus' struggle to return home, this 40 page book or PDF supplement to 7th Voyage provides new rules and campaigns based on these epics.